Yay! 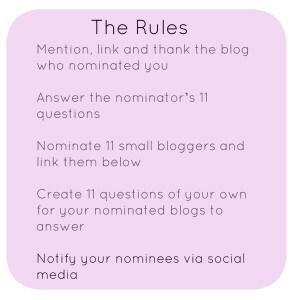 I have been nominated for the Liebster Blog Award! I would go to England in the 80s so I could become best friends with J.K. Rowling so she would consider creating a character based on me. What songs most speaks to your heart? I have no idea how to answer this question because there are so many. Many songs represent different people and other songs represent different times of my life. How do you find inspiration for you blog? I find inspiration from other posts, magazines, and things that I see on Facebook. AND BOOKS! Literature. I could talk about books all day every day. I started blogging to find my voice. I was struggling with remaining body positive and being surrounded by such positive women is quite an inspiration. My irrational fear would have to be rodents. I will cry if I make eye contact with anything remotely rodent-like (Even bunnies). My real fear is failure. Other than J.K. Rowling? I would have to say…Tess Holliday. What you love most about where you live? There is not a lot to love, but I love that it is home. No matter where I go, I cannot vision living there. What is your guilty pleasure TV show or film? Hmmm. That’s a deep question. I will have to get back to you on that one. London because I think I could rock an accent. If you could relive a particular year of your life knowing what you know now, what year and why? How do you come up with new blog posts? If you could pull a Freaky Friday with anybody who would it be? If you were able to have any color hair, what color would you choose? What is the most embarrassing station on your Pandora station list? Who’s concert would you give your left arm to attend?